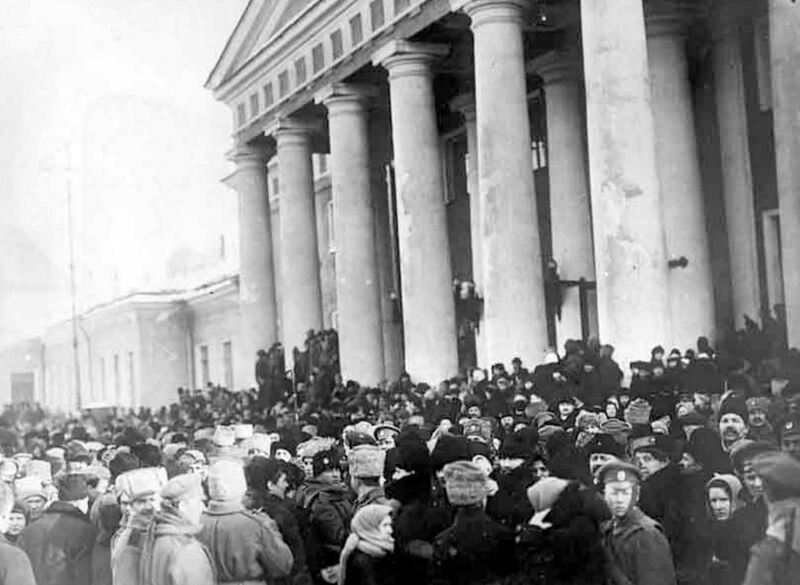 The February Revolution erupted 100 years ago today and swept away a blood-soaked monarchy. But it was clear in his work at the time that Lenin knew the political situation in his home country could boil over at any moment. For three hundred years, the Romanov dynasty had ruled Russia, then a sprawling empire in which Russian speakers were a minority, with an iron fist. Far from languishing in isolation, the tsars branded their reactionary mark on Western Europe, providing vast peasant armies to back up monarchy and reaction in the face of democratic and nationalist movements from the French Revolution of 1789 onward. The Romanovs even earned top billing in the roll call of mortal enemies in the opening line of the Communist Manifesto. Yet at the dawn of the twentieth century, the empire’s foundations were riddled with holes. First and foremost, the tsar was the greatest landlord among a class of landed barons who survived their Western European feudal counterparts by a century or more — serfdom was only abolished in 1861. This class of thirty thousand aristocrats owned some 189 million acres (estates averaged 5,400 acres), or more total land than fifty million poor or middle peasants held all together. Beyond being “a ready-made program of agrarian revolt,” the numbers also betrayed the widening gap between the productive power of industrializing Western Europe and agrarian Russia. Worried his technological lag might put an end to military might, the tsar leaned on French and English banks in order to finance a modern, and highly centralized, arms and metallurgy industry centered in St Petersburg and several other sites. Some of the world’s largest factories sprang out of Russian soil, concentrating in them a new class of people who had nothing to sell but their labor power. In Lenin’s 1899 Development of Capitalism in Russia, he estimated that by the 1890s there were ten million wage workers in the country. The tsar sought to bind this “amalgam” together with the lash. Antisemitic gangs known as the Black Hundreds roamed the countryside terrorizing Jews, Great Russian nationalism barred education in local languages, and strikes were met with military force. And in hopes of seizing a western coast port while stoking the fires of patriotism, the crown went to war against Japan in 1904, but superior Japanese equipment and fighting acumen soon brought opposition at home to a boil. On January 9, 1905 hundreds of thousands of workers, students, and the poor marched behind a priest, Father Gapon, beseeching the tsar to lessen their burden. They were met with bayonets and live ammunition, leaving hundreds to bleed to death in the streets. The Great Dress Rehearsal of 1905, as it became known, exposed a multi-sided social conflagration: peasants against landlords, workers against bosses, and virtually the whole country (including some sections of the middle class, and even some capitalists) against the monarchy. Amid revolution, the socialist left blossomed. In the years prior to the famous 1903 Congress of the Russian Social Democratic Labor Party in which the Bolsheviks and Mensheviks first united and then split — in addition to complicated negotiations with significant organizations of Jewish, Polish, Finnish and other nationally based socialist organizations — there were perhaps some ten thousand affiliated party members in the various factions. By the so-called Unity Congress in the spring of 1906, tens of thousands had joined, and by the 1907 Congress of the Russian Social Democratic Labor Party (including its national sections), membership rose to nearly 150,000, despite brutal repression. So terrified at first was the tsar that he granted the revolution a concession, a sort of toy parliament called the Duma. At first, urban workers were not even granted the vote, although the body was later amended so that every two thousand landlords elected a delegate compared to every ninety thousand workers. This meager offering was both more than Nicholas wanted to relinquish and not nearly enough to placate the revolution, so the state turned Russia into a cemetery — fifteen thousand executed, twenty thousand wounded, forty-five thousand exiled. Blood smothered the fire, for a time. By early 1912, strikes were on the rise again until the lid was blown off in a Siberian gold-mining town called Lena where tsarist troops shot down hundreds of strikers. The working class arose like a phoenix from the ashes, the socialist parties expanded once more, and strikes proliferated. In 1914, the socialist paper Pravda had a daily circulation of thirty to forty thousand — in a largely illiterate country. The summer of 1914 witnessed Russia stretched to the breaking point — the status quo had become unbearable. Nicholas declared war on Germany on July 19, 1914. Only this time, rather than a more or less contained conflict with Japan on his far eastern border, war with Germany and the Austro-Hungarian Empire brought famine and pestilence to monarchy’s very doorstep. However, in the war’s opening days, an enthusiastic patriotic wave buoyed the tsar’s standing. Hundreds of thousands of peasant boys and young men rushed to join the army and nationalist rallies dotted city plazas and village squares. But all the conflicts that drove 1905 were soon brought to a fever pitch. The Great War delivered “packed graves” to the Russian masses on a scale almost impossible to imagine. World War I presented the spectacle of the most backward and underdeveloped social system on the continent pitch headlong into a life-and-death struggle with the most advanced industrial economy in the world. The results were terrifying. Three million soldiers in the tsar’s imperial army died, another four million suffered injuries, and some three million civilians perished from war-related causes out of a total population of some 175 million. Faced with Germany’s military technology, the tsar sent hundreds of thousands of poorly armed, ill-equipped soldiers to certain death. Over the course of the winters of 1915, 1916, and 1917, tens of thousands of soldiers simply froze to death in their trenches. Peasant uprisings increased as the war dragged on as in 1905, but this time they were concentrated in a new form; namely, the conflict between aristocratic officers and peasant soldiers in the trenches. Each time an officer ordered a suicidal charge into the German fire, not only were the lives of individual peasant soldiers at stake, but so too was the very future of the family who relied on their sons to return home for care and labor. Moreover, feeding the army robbed peasant families of their sustenance and the seeds for next year’s crops. Perhaps Nicholas, or at least the monarchy, might have survived the growing peasant anger, catastrophic military losses, and discontent within his own class. Yet an even more potent enemy was rising to its feet. For just as the war filled the trenches with blood, it filled St Petersburg with proletarians. The same working class that had fought the regime to a standstill in 1905, and suffered so terribly for its efforts, was now relied on to manufacture and distribute every rifle, every bullet, every shell, every rail car, on which the tsar’s war depended. More, Nicholas had no choice but to strengthen this foe. Hasegawa reports that between 1914 and 1917, the number of workers in St Petersburg grew from 242,600 to 392,000, or some 62 percent, with women making up a quarter of all employees. Strikes did recede in the early patriotic days of the war — for example, while some 110,000 workers struck before the war in 1914 in honor of Bloody Sunday, only 2,600 walked out on January 9, 1915. But as the war effort collapsed, walkouts proliferated. In the six-month period of September 1916 to February 1917, some 589,351 workers struck, around 80 percent of them participating in political strikes. Furthermore, amid this mass movement, tenacious socialist organizations built on a long struggle to implant themselves among workers. Thousands of revolutionaries had lost their lives in 1905 or in the ensuing repression, and thousands more had been drafted and sent to the front in an effort to purge the workers’ movement of battle-hardened organizers. The tsarist police, indeed, came perilously close to eradicating the organized socialist left at several points; however, the seeds of more than a dozen years of pitched confrontation, underground party organization, and socialist education had taken root. Unlike in Germany and France, where the leadership of the most important socialist organizations backed their own ruling classes in World War I, much of the Russian socialist movement adopted antiwar, internationalist principles. On the whole, St Petersburg practically teemed with revolutionary socialists organized into party groups operating in various states of competition and cooperation, including Bolsheviks, Mensheviks, Mezhraiontsy, Social Revolutionaries, and even anarchists. Of course, there were some well-known social patriots, most remarkably right-wing Menshevik leader Georgi Plekhanov, the “father of Russian Marxism,” who both Lenin and the Menshevik-Internationalist Julius Martov once considered a mentor. It is only when the “lower classes” do not want to live in the old way and the “upper classes” cannot carry on in the old way that the revolution can triumph. The working class in the Russian Empire was not alone in resisting the conditions arising from the war. Karl Liebknecht broke with the pro-war leadership of the German Social Democratic Party and voted against war credits in parliament, Luxemburg wrote the antiwar Junius Pamphlet from prison, French and German soldiers declared a unilateral Christmas truce, and the left wing of the American Socialist Party and the Industrial Workers of the World vehemently opposed Woodrow Wilson’s war drive. But the depth of the social, economic, and military crisis in Russia and the political consciousness and organization of the working class (in addition to the escalating revolt among soldiers, peasants, students, and oppressed nationalities) raced far in advance of anywhere else in the world in the winter of 1916–17. On top of all of this, a beautiful illusion (if not universally shared, then common enough) bound the broad anti-tsarist movement together. That is: cut the head off the monarchy, and peace, democracy, and prosperity might come to Russia. It was not long before Russia’s revolutionary movement put that thesis to the test. February was only the beginning. Todd Chretien is a Bay Area activist and a frequent contributor to the International Socialist Review .